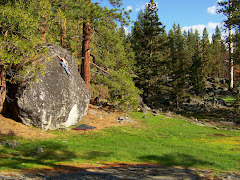 Most of the bouldering that gets me psyched is usually a 40 minute drive away in Kirkwood. However, yesterday Frank Lucido took me to one of his old stomping grounds, the Off Road Area. This area was about a 2 minute drive from my front door. Although the hike to the top was uphill there was good bouldering along the way. I repeated the gem of the area, Gobstopper v9 for its second ascent. This problem was really cool. It follows a series of blob-like features, each having its own series of intricate holds. The line is also north facing so it gets lots of shade. I did some other lines on the way. The Tree Problem v4 is half way up the hill. This is a really good line on a cool tallish boulder. The Sunset Crack v6 is a must do on your way back down. This seemingly easy looking problem follows a good crack, but then turns a cornor and becomes very insecure. It has a very classic feel to it. The area had a lot more to offer than these. This place, like most spots in Tahoe, had a lot of good rock and bad rock. There was no doubt this area had more problems to do. Props go to Frank for giving me the tour and authoring these rad lines.